Sometimes, it can be hard to make a decision. You have four viable options laid out before you. What to do? I decided it would be easier for me to just choose them all. For my cousin's bridal shower, I assembled a fruit tray with apples, grapes, and strawberries.﻿ And, because I couldn't settle on one dip for the fruit, I used all of my options and made four in hopes that everyone would find something that they liked. I think you might find one you like, too. Plus, these recipes are so simple and easy to prepare. You may want to do all four, too! 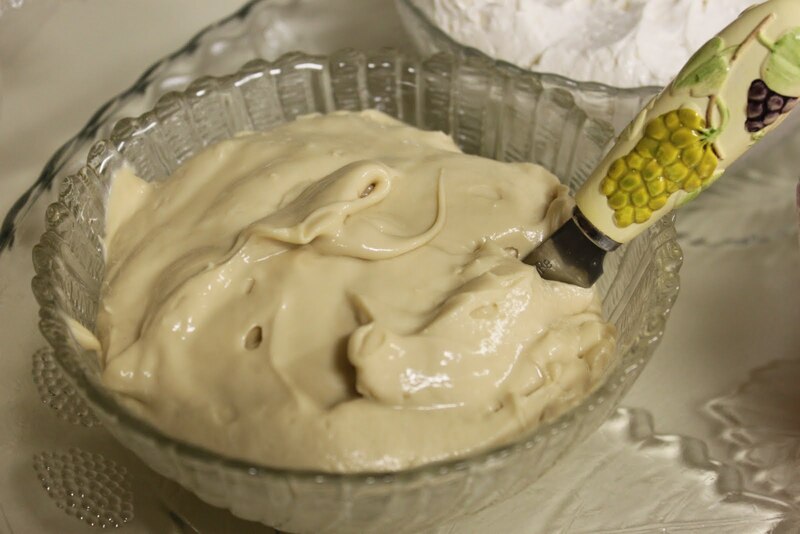 Using a mixer, blend all of the ingredients together until fully blended. Refrigerate until ready to serve. Blend the cream cheese, powdered sugar, cocoa, and vanilla together until smooth. 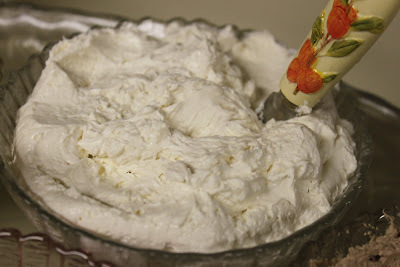 Add the whipped topping and blend until smooth. Refrigerate until ready to serve. With a mixer, blend the cream cheese, powdered sugar, and vanilla until creamy. 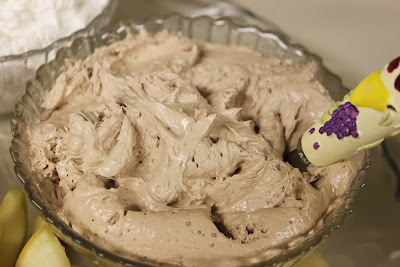 Add half of the whipped topping and blend in with mixer. After the whipped topping is well incorporated, fold in the remaining whipped topping with a large spoon or rubber spatula. Refrigerate until ready to serve. In addition to the fruit, I also served a bowl of cubed pound cake and a small bowl of butter cookies. A frozen Sara Lee pound cake works beautifully here because of its spongy, firm texture. The caramel dip is perfect with apples. 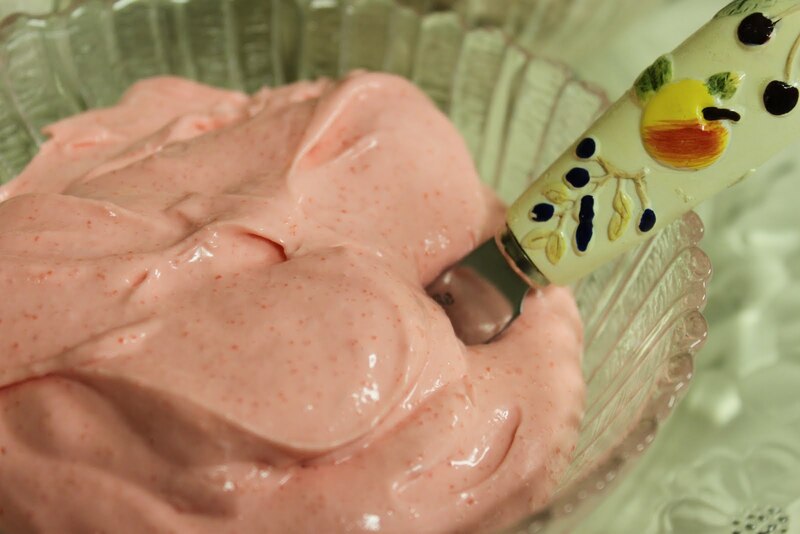 The chocolate dip and vanilla dip are perfect with the strawberries. Sometimes, I like to create a strawberry shortcake platter using the vanilla dip, strawberries, and cubed pound cake. In fact, I might make some with the leftovers right now. I also like to prepare my dips and let them sit overnight before serving so that they can thicken and the flavors can blend. What?!?! No Toffee Dip?! This look delicious. I guess I should try other things. No toffee dip this time. Decided to go in another direction, Julia. Fortunately, the recipe is right here: http://www.wellseasonedlife.com/2010/10/toffee-apple-dip.html and still one of my most popular recipes here! oh these are great! i try not to have fruit dip because well i love it and i'll end up having more dip then fruit and it takes away the health factor but wow, i want these bad! Lark, I did notice some people just eating spoonfuls of dip. They all sound (and look) delicious! Have to try the others, I've had the strawberry before and loved it! 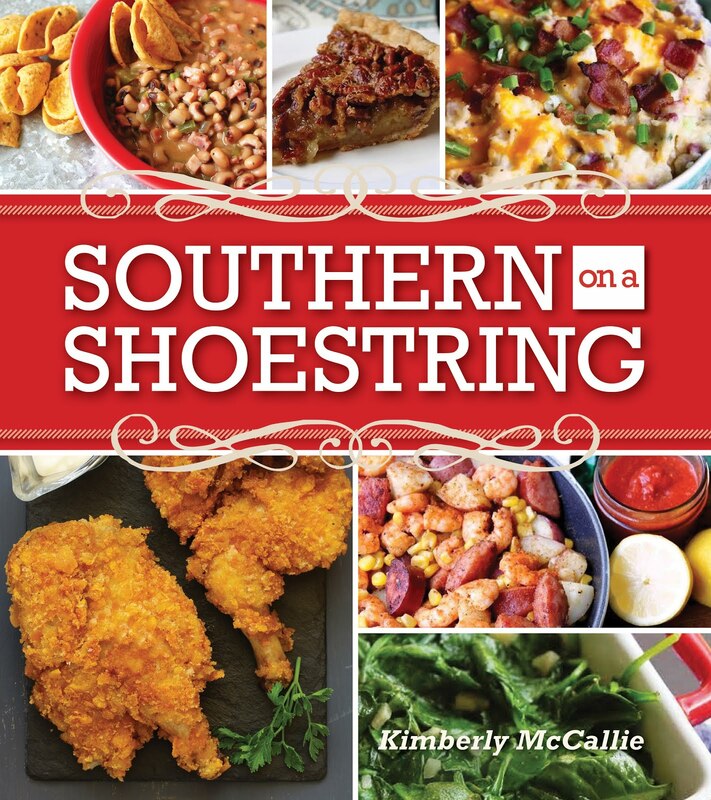 So yummy - thank you for sharing these recipes! 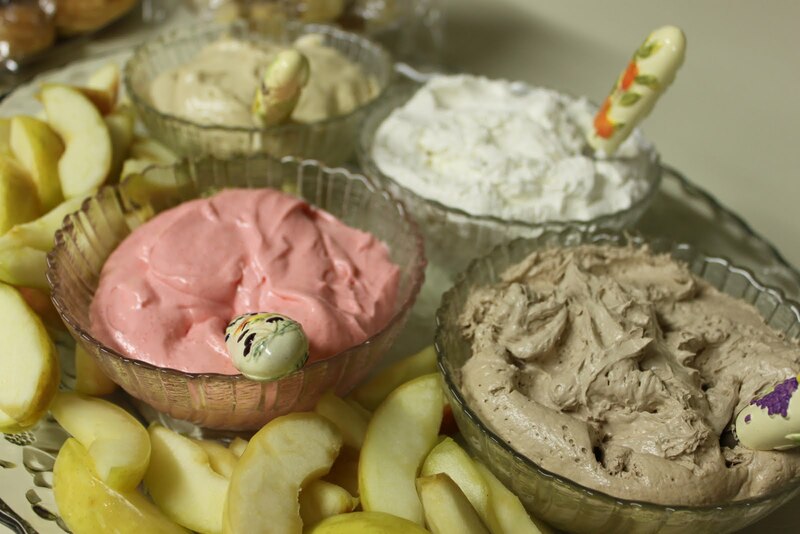 Oh my, all four of these dips look so delicious! Can't wait to try them soon! Love it! I am always looking for dips for fruit - because I love taking fruit trays to parties! These all look great. Plus, I'm always drawn to marshmallow creme, don't know why. Cause it's good, probably! I know what you mean, Beth. Just the smell of marshmallow creme is irresistable. I love it, too! These all sound delicious. I think I will try the whipped chocolate one first! Stopping by from Made it on Monday. All of these dips look wonderful--and I really like how they look grouped together. But I have a feeling I'd linger at the bowl of chocolate! Everyone has their favorite. I'm partial to the whipped vanilla dip. I love it with the strawberries and pound cake. Such a good strawberry shortcake! Yum! Yum! 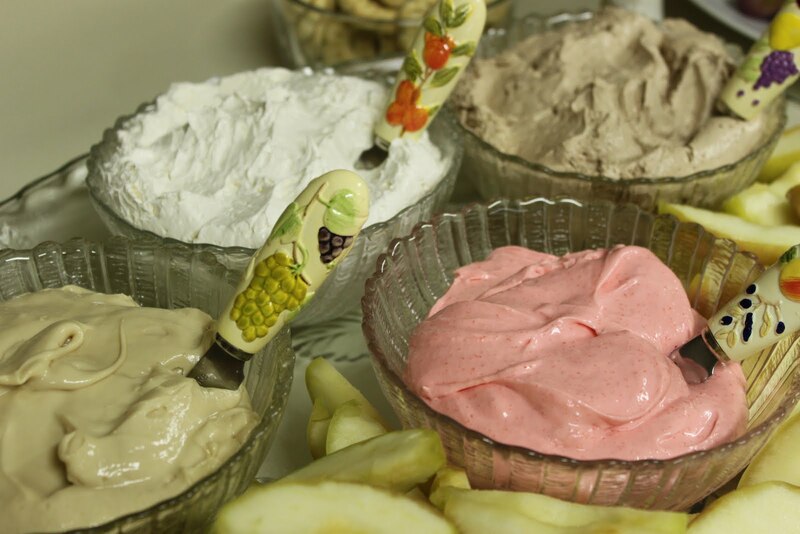 I love fruit and dips that go with them. Go idea for all the variations. You could actually make one huge recipe of the original, divide it up, then add all the mix ins! Heather, you're right. Almost all of them start off with cream cheese, powdered sugar, and vanilla. You could just divide that up and add the different flavors in. That would really work if you only wanted a small batch of different flavors. Yum, yum! 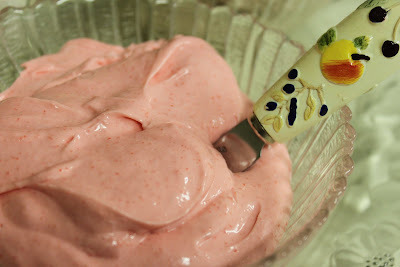 I love fruit dips this time of the year.